As you glance into the future, do you see a life of endless work stretching out in front of you? If so, you're not alone. An increasing number of people are wondering how they'll ever be able to retire. But maybe things aren't as bad as they seem. In fact, a recent study found that delaying retirement by just a few months could have a major impact on your ability to retire and your standard of living in retirement. A National Bureau of Economic Research (NBER) study concluded that "working three to six months longer boosts retirement income by as much as increasing retirement contributions by one percentage point over 30 years of employment." 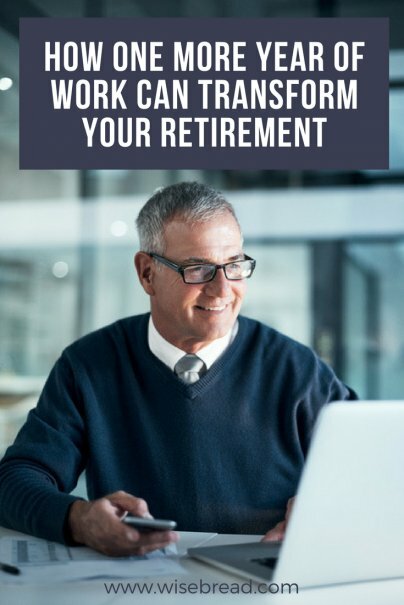 More specifically, the study found that instead of retiring at age 66, working until age 67 can boost retirement income by 7.75 percent. By contrast, increasing the amount of earnings saved in a retirement account by one percentage point starting at age 36 and keeping it at that level for the next 30 years would raise retirement income by just over 2 percent. The NBER findings held true for singles as well the primary earner of married couple households across a wide range of incomes. That isn't to say that increasing your savings rate is a bad idea. It's just that of the two main options available to workers who are behind on their retirement planning — saving more or working longer — working even a little longer will likely pay higher dividends than saving more. The researchers noted four benefits from delaying retirement. First, each additional month of work provides an opportunity to save more in a retirement account. Second, it gives that account balance more time to grow. Third, if you plan to buy an annuity, each month that you hold off will increase the benefit amount for the same cost or lower the cost of the same benefit amount. Fourth, and by far most importantly, each month you delay retirement will boost your Social Security benefits. The earliest you can claim benefits is age 62; the latest is age 70. Between those two points, each month that you wait will increase your monthly benefit. You can review your estimated Social Security benefits by creating an account on the SSA website. You'll see how dramatically different your estimated monthly benefits will be at age 62, at your "full retirement age" (67 for those born in 1960 or later), and at age 70. For example, my benefit will increase more than 50 percent if I claim at age 67 instead of 62. And if I wait until age 70, my benefit will be nearly twice as high as my age 62 benefit. Once you know your full retirement age benefit, you can also estimate the month-by-month or year-by-year differences in your benefits by using the SSA's calculator. For example, if I were to claim benefits beginning at age 67 instead of age 66, waiting that extra year would give me a 6.5 percent raise — $2,750 per month vs. $2,582, a difference of $168 per month or $2,016 per year. To understand how that compares to saving more, let's start with "the 4 percent rule," a common recommendation to withdraw no more than 4 percent of your nest egg each year in order to make sure your retirement savings last throughout retirement. Following that guideline, it would take $50,400 of additional retirement savings in order to provide a $2,016 boost of yearly retirement "income." There may be other benefits to delaying retirement as well. Medicare eligibility begins at age 65, so if you retire before then, you'll need to find coverage elsewhere, which can be expensive. By the same token, if you continue to work past age 65, you may be able to hang onto your group health insurance, which may be more comprehensive than Medicare. Employer-sponsored training is another valuable benefit, whether it comes in the form of tuition reimbursement for college classes or in-house workshops. If you're among the growing number of people who plan to do some type of work for pay after leaving the full-time workforce, new skills you pick up on your current employer's dime could be well worthwhile. Published author of four personal finance books.